This is an album I grew up with as a wee one, and thanks to the owner of the Audio Archives blog, I was able to download an .mp3 of the entire album. In fact, the Audio Archives blog has numerous old albums on .mp3. 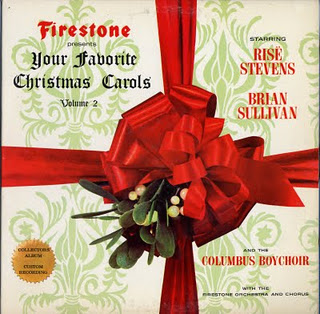 I also downloaded Firestone's Volume 4, and an RCA Victor collection (RCA Victor Presents Music for the Twelve Days of Christmas). The album in this discussion features Risë Stevens (mezzo), Brian Sullivan (tenor), the Columbus Boychoir (now the American Boychoir, since their 1980 move to Princeton, NJ), along with the Firestone Orchestra and Chorus. There are twelve tracks on the album, songs done by each of the "stars" on the album. You can even sing along, as the lyrics are on the back of the album jacket. The album ends with The Twelve Days of Christmas, performed by (as appears in the credits) "Entire Company". Yup - everyone on the album! And to boot, each verse has its own arrangement, vocally and orchestrally - a different color to each verse, pretty much. Several key changes as well! Verse 1: Key of E-flat, sung by Risë Stevens, backed by the Columbus Boychoir. Verse 3: Key of A-flat, sung by Brian Sullivan. Verse 5: Key of F, sung by Chorus. Verse 6: Key of B-flat, sung by the Columbus Boychoir. Verse 7: Key of E-flat, started by Risë Stevens, backed by the Columbus Boychoir. From this verse on, you'll see the switching off of artists for each line (6 geese, 5 rings, etc.). Verse 8: Key of A-flat, started by Brian Sullivan. Verse 9: Key of F, started by the men of the chorus. Verse 10: Key of F, started by the Columbus Boychoir. Verse 11: Key of F, started by Risë Stevens and Brian Sullivan. Get the entire album here!